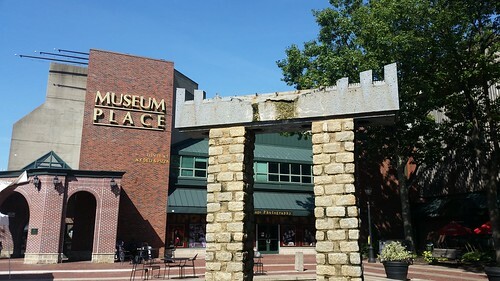 The main entrance to Museum Place or the "East India Mall." I've always had hope for the East India Mall, but it has unfortunately been the same for the twenty years. A mall that has a variety a few stores that are constant, but not necessarily popular, and a whole slew of businesses that come in and out with regularly frequency because traffic in the mall itself is sporadic. Still, the exterior of the mall which runs along the walking section of Essex Street is still a fabulous little pedestrian space for people to wander and hang out. The water fountain has been around for years and I remember years ago when I worked at the YMCA that coming to the fountain was a regular activity to keep the kids occupied.